There are many reasons for hiring a smaller venue. However, one thing’s for certain, whatever your reason, you’re going to need space-saving furniture. There’s a lot to be said for smaller venues. First of all, they are cheaper to hire, secondly, they automatically limit the number of people you can invite. This is another way of cutting down costs. Smaller venues are undoubtedly more intimate. They lend themselves perfectly to private functions and personal events. Even so, they do present problems, namely, a lack of space. This is where you have to be a little bit clever with your hire furniture. But what exactly do we mean by space-saving furniture? When it comes to space-saving furniture try and think about items that have a dual purpose. Or think outside the box wherever you can. One example we love is the vertical buffet. This is a perfect example of using space in an innovative way. Imagine a bookcase but crammed with delicious canapes and appetisers. Guests can pluck tasty food bites from selves, saving space in the venue for seating or other necessities. Cubes can be used as a seating option or a table or even both at the same time. Furthermore, our LED cubes add light and a touch of WOW to the most mundane of venues. Use cubes for your more contemporary events where your guests don’t mind perching on a square with their friends. They wouldn’t work for older people who prefer a little comfort when they go out. Benches save space in a way that chairs simply cannot. You can squeeze a lot more people onto benches when you line them up together. Not to mention, there are all kinds of different benches to choose from. Why not pimp them up with soft furnishings like over-sized cushions? 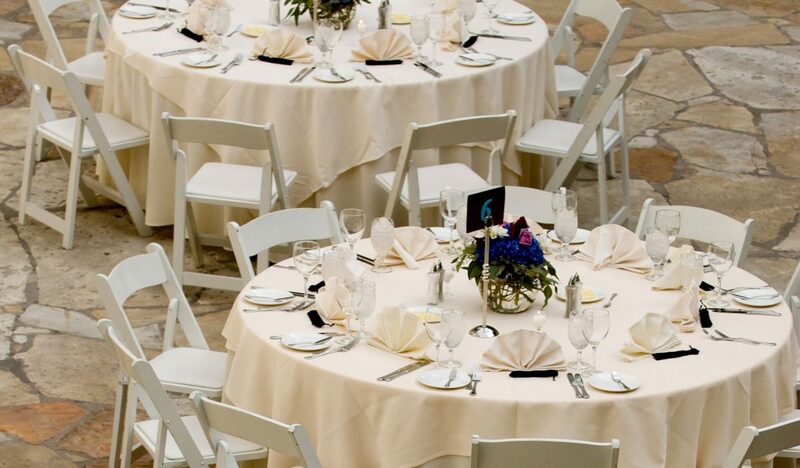 To get two events in one small venue, why not consider hiring folding chairs? For example, house the wedding buffet in the afternoon or evening, then, remove the chairs for the night-time entertainment. Equally important, folding chairs are always great value for money, come in a variety of colours, and work in a number of settings. Who says you have to sit down at every event you attend? Using cocktail tables allows somewhere for your guests to gather around. It also gives them a place to pop drinks or food while they go off dancing or networking. Perfect for space-saving! As with our vertical buffet, if you don’t have the space to spread out horizontally, why not go up instead? Table risers are simply extra shelves on your existing buffet table. They just add an extra surface for you. You could, for instance, place all the main buffet food items on the actual table, and pop the desserts on the risers. Or why not use the risers for drinks and cocktails? Finally, you might not think that a mobile bar is a space-saving piece of furniture, but it certainly is. Consider the number of glasses and bottles of drinks you need for your event. Now, where are you going to put them all? A mobile bar is an effective and efficient way of getting drinks to your guests with a minimum of fuss.